Kidney stones are firm deposits, created with salts and minerals, which may appear in the kidneys and go through the urinary tract. In normal cases all body wastes are dissolved in the urine and eliminated by the kidneys. Sometimes mineral balance becomes disturbed, leading to formation of the kidney stones, especially if you don't drink enough fluid to wash the waste products away. There are actually different types of kidney calculi. The most common of them are made of the calcium oxalate. They mainly occur, when you eat too much of high-oxalate foods like fruits, vegetables, nuts and chocolate. Other types of kidney stones include uric acids, struvite and cystine stones. Actually not all people have the same risks of having nephrolithiasis (medical term for kidney stones). Experts say that those, who suffer from obesity, hyperparathyroidism and gout, are much more likely to have stones anywhere in the urinary tract. Furthermore it was found that this disorder runs in families. 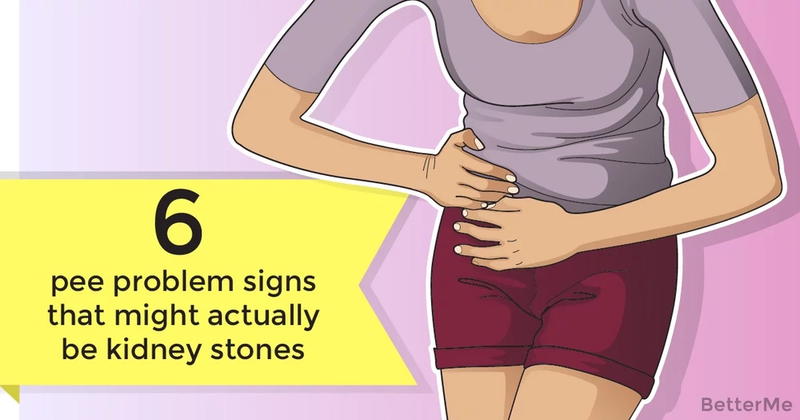 So if your mother had kidney stones, your risks are really high. READ MORE: What’s behind a man’s decision to cheat? #1. Back pain – sharp unbearable pain in the back, side and groin is one of the most common complaints, which bring people to emergency rooms. It usually develops, when a stone runs into the narrow ureter and blocks it, increasing pressure in the kidney and irritating the nerves. #2. Frequent urge to urinate – feeling too frequent need to visit lavatory may indicate not only urinary tract infection. Having kidney stones can also increase your urge to go. #3. Burning sensation during urination – it's easy to confuse kidney stones with urinary tract infection, if you experience pain and burning, when urinating (especially if you do it too often). #4. Bloody urine – big stones can damage the lining of the urinary tract, leading to hematuria (blood in the urine). #5. Nausea and vomiting – sometimes stones in your kidneys may put the pressure on the nerves in the gastrointestinal tract, causing upset stomach symptoms. #6. Cloudy urine with specific odor – several studies show that it's not uncommon for people with kidney stones to have concomitant urinary tract infection. This can make your urine cloudy (because of the pus presence) and foul-smelling.